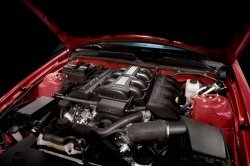 E-Force 2005-09 Ford Mustang GT Competition Kit  : Supercharger Superstore, Your Online Source for Vortech Superchargers, Paxton Superchargers, Procharger Superchargers, Magnacharger Superchargers and Techco Superchargers! Edelbrock E-Force Competition Supercharger kit #1585 includes all of the essential components that a racer or tuner shop would need to build a custom supercharger for racing applications. Our competitors kits often require that you buy a complete system and then remove the components that would not be utilized on a custom build. The Edelbrock E-Force Competition kit #1585 gives you the option of choosing the equipment you want when building a custom supercharged Mustang. This kit includes the essential supercharger package components with selectable options based on your purpose built needs - from our Competition Air Intake System #15808 to fuel injectors (available in 41 lb/hr and 60 lb/hr), pulleys (available in 3.5", 3.25", 3.0" and 2.75") and much more. Finally, finish off your custom installation with a set of Edelbrock E-Force Coil Covers #41133. These covers are black powdered coated for durability with contrast machined fins and the Edelbrock logo for a clean look. 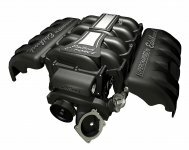 We are confident that our E-Force Supercharger Systems will provide the best performance at a competitive price. Our systems are also easy to install and are the quietest on the market today. Each system is backed by Edelbrock's exceptional customer service and superior quality.